Links are to articles and reviews on sansmirror.com, my mirrorless camera site. Usually when someone gets so attracted to one of these cameras that they switch from their DSLR, they declare "the DSLR is dead." But if you look closely, you'll also see a clear subset of these folk eventually come back to a DSLR. It's grass-is-always-greener syndrome. There's been a lot of grass growing on the mirrorless side of the fence, not a heck of lot of new interesting grass growing on the DSLR side of the fence. So my first comment would be this: if Canon and Nikon eventually find that their DSLR businesses are eroded by mirrorless offerings, they can fault no one else other than themselves. When mirrorless first appeared, the formula for protecting DSLRs should have been: downsize them, make sure their basic capabilities (sensor, focus, features) were top level, fill out the lens and accessory lineups, plus get the DSLRs connected to the modern Internet world. Nikon is just now getting around to reducing size in the D3300/D5300 and hasn't done it in the D7100, D610, D800 models. Even in the entry DSLRs, Nikon's downsizing is extremely modest, and the biggest change has been the new collapsing 18-55mm lens, though even that doesn't come close to matching some of the collapsing mirrorless lenses (witness Sony's extremely small 16-50mm). Nikon did a little better in the basic capabilities realm, as all the DX cameras are 24mp now, some of the focus systems have been upgraded, and features are slowly trickling down the line ala the age old Japanese consumer electronics formula (hint to Nikon: if you know the formula, so do your competitors, and they'll know how to attack it, so you have to do better than the formula). And, of course, I've written extensively about how Nikon has just totally botched the DX lens lineup. Fujifilm already has a better APS lens lineup than Nikon. Technically, so do Samsung and Sony. The good news for Nikon at the moment is that all those existing FX lenses make the DX DSLR telephoto options look like nirvana compared to the mirrorless cameras. But in the under 100mm equivalent range, Nikon's DX line looks weak in comparison to the lenses available for all those cameras I listed at the top of this article. Moreover, DSLRs still don't fit into the modern Internet world all that well, and Nikon has exactly one DSLR with built-in WiFi, and that's poorly supported. Note that the Fujifilm X-T1 has an Android/iOS app that can remotely control the camera via WiFi, and is already more feature packed than Nikon's. That said, Nikon has gotten lucky that some of the swings at them aren't all there yet. As much as I like the Sony A7/A7r, these cameras have some issues, and while Sony has now outlined a pretty full lens road map, the truth today is I have two really good and one mediocre lens available that are designed for those cameras. Coupled with other things where the A7's don't match the DSLRs, neither is going to get the D800 out of my bag any time soon. The real threats to Nikon are the Olympus E-M1 and the just announced Fujfilm X-T1 (at right). We have no truly weather proofed DX DSLR, but both these mirrorless cameras are pretty impervious to anything you might throw at them. The feature sets of both are full. Both have live histograms (Bueller?). Both have well designed controls that are arguably better than what Nikon did on the Df. Both have tilting rear displays (Bueller?). Both are reaching into D300-level performance in many aspects, but with better image quality (Ferris Bueller?). One thing that has to send shivers down Nikon's spine is that the Fujifilm X-T1 looks like it will follow focus a lot of continuous action at 8 fps with a 23 frame raw buffer (using UHS-II cards). That's D400 territory. 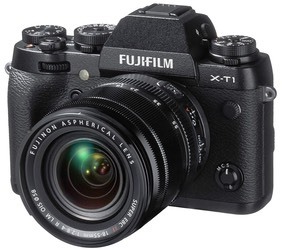 Yet the X-T1 is smaller, lighter, and less expensive than a D400 would be if it existed (Bueller?). But note that I wrote "grass is greener." This is not to say that the mirrorless offerings still don't have issues and deficiencies that can't be beat. Fujifilm, for instance, is still very weak on flash. A 1/180 flash sync speed, no high speed sync, no real wireless option, can be sticking points for some photographers. The EVF in the X-T1 is 54Hz, the Olympus 60Hz. The Olympus slows down to 30Hz in low light. As fast as the makers claim the EVF refresh is, there's still lag there. What you see in the viewfinder already happened, so you have to learn to anticipate peak action, not react to it. I've written elsewhere that the D800 is the best all around interchangeable lens camera currently available (and has been since it first shipped). That's still true today, and there's a good chance that it will remain true, especially if Nikon keeps the camera updated and doesn't let it wither like they have the D300. The DX DSLRs are still really good values (note that the Fujifilm X-T1 costs more than a D7100 and has fewer pixels). Still, the mirrorless makers are inching closer and closer. Moreover, they've all picked up on Nikon DX's (and Canon EF-S's) Achille's heel: lenses. This is probably the year that Canon and Nikon have to really respond to the mirrorless threat. By the time we get to Photokina in the fall, we're going to see more and more encroachment of the mirrorless systems, I think. If these high end mirrorless cameras weren't so expensive, we'd already likely see more leaking from DSLRs to mirrorless than we currently do. But if they keep progressing the way they are, even price won't save DSLRs. Don't count Canon and Nikon out. They can see what's happening. They know they need to respond, and they almost certainly will. But in my book, responding sooner is far better than responding later. Sooner has already passed.